There are millions of music enthusiasts all around the world. These individuals absolutely love listening to their music no matter where they go. If you fall within this category, you understand the importance of having a great audio system in your vehicle! Of course, purchasing an audio system for your vehicle isn’t a cakewalk. There are various different speakers and pieces of equipment that you will need. You’ll want to go above and beyond to purchase one of the best car amplifiers. Within this guide, you’ll learn everything you need to know to make the right purchase for your particular situation! Before rushing out and purchasing an amplifier for your vehicle’s audio system, you should take a step back and get to know these devices more thoroughly. By doing so, you will be able to figure out exactly which amplifier will work best for your particular setup. Below, you’ll find out which factors are most important and why they are. Price – Price will undoubtedly be a factor for almost everyone. Car amplifiers can vary significantly in price. With this in mind, you shouldn’t allow this figure to cloud your judgment. Instead, you should set a budget for your purchase and stick with it. Power – When attempting to find out the delivered power, you will find an RMS number. This is the root mean square power and it is exceptionally important. This figure tells you the maximum AC signal that the amp can withstand. This will usually come as a wattage number and there should be a number for each channel. Some companies will lump both channels together in one single figure, in order to make their amp look better. A 50-watt total results in 25 watts per channel. Crossover – Some amplifiers are equipped with a crossover. 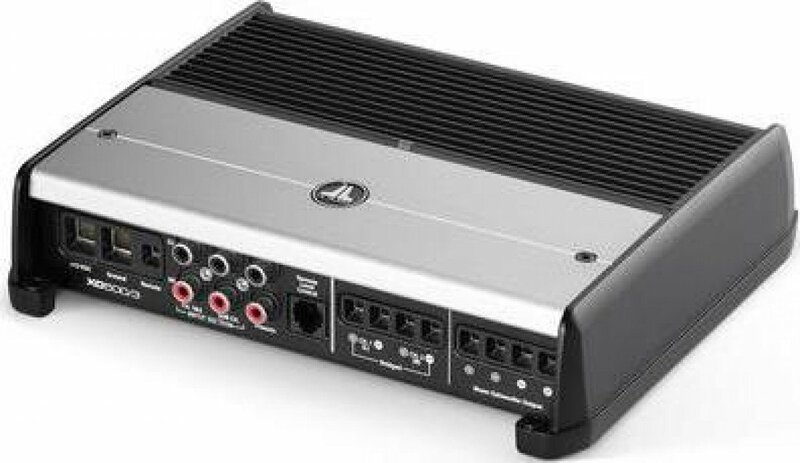 If you’re planning on connecting your amplifier to your car’s existing speakers, you’ll definitely want an amplifier with a built-in crossover. This will give you the ability to send high frequency sounds to the smaller speakers and the rest to the bigger speakers. Bass Boost – Some of these devices provide a bass boost function. If you’re going to be listening to a lot of hip-hop or music that features a significant amount of bass, you’ll definitely want this feature added. Channels – Multiple channels are absolutely vital, if you plan on using multiple speakers. Each channel will power a different speaker, so be sure to choose an appropriate number of channels for your particular setup. Overall, the above factors are the most important, when choosing an amplifier. Be sure to inspect each amplifier carefully and note the above factors to help you make the right choice for your audio system. Below, you will be able to find a breakdown of some of the best car amplifiers on the market. If you already have a built-in speaker system in your vehicle, but want to upgrade the sounds, then you should consider the Rockford Fosgate Prime. This amp is constructed out of high-quality materials, which will offer durability and longevity. Below you will discover more information about this device, so you can decide whether or not it is suitable for your needs. The Fosgate Prime is very compact, so you can store it inside of your trunk or underneath your seat. Of course, you may not want to hide this awesome looking amp, since it is very eye appealing. You will receive a bass equalizer with your purchase, along with all of the installation hardware, which will save you quite a bit of money. The remote bass knob is equipped with a very bright blue light, so you will not need to turn on your interior lights to make adjustments to the equalizer. You will receive a very loud, clear sound every single time, without experiencing any overheating. 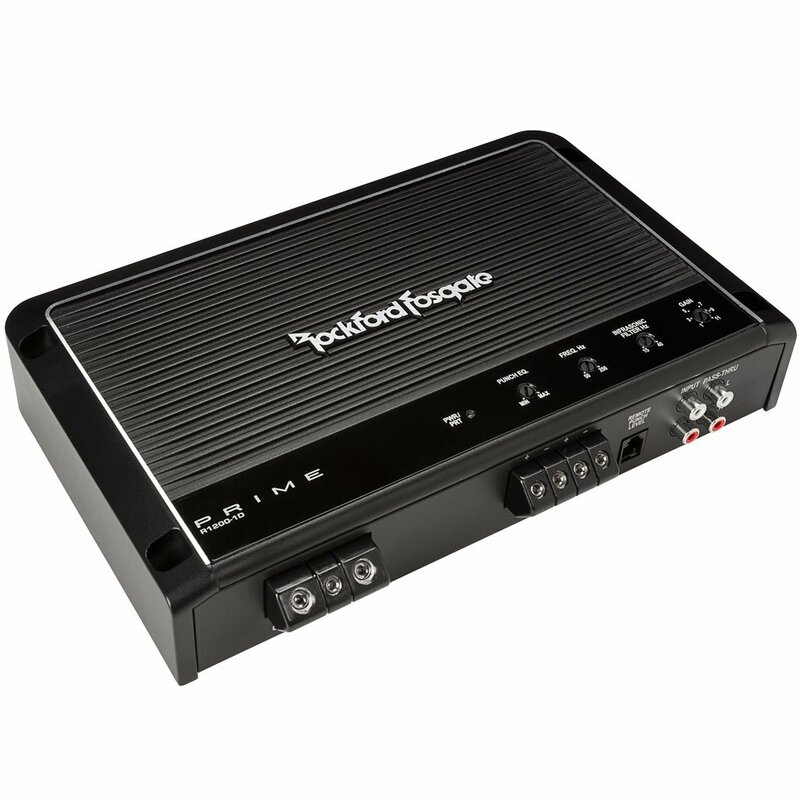 If you are searching for an amplifier that will fit into a compact vehicle, without bogging up a lot of space, you should look no further than the Rockford Fosgate Prime. The construction and design of this amp makes it worth every cent that you will spend. There are many aspects of your audio system that are important, but your amplifier of choice could make or break it. With this in mind, you should take the time to check out the JX1000/1D Monoblock Amplifier. It is fairly affordable and is reasonably priced for most individuals. The overall dimensions of the device are 11” length by 7.75” width by 2” high. This guarantees that you won’t have any difficultly finding room for it inside of your vehicle! This amp can be used at various ohms and delivers a maximum RMS of 1,000. The device features a soft start turn-on, which ensures that you won’t hear clicking and popping, when the system is switched on. You can also control the amp’s bass delivery, thanks to the variable bass boost functionality. The amp is very lightweight at 8 pounds, which makes installation a little more convenient. 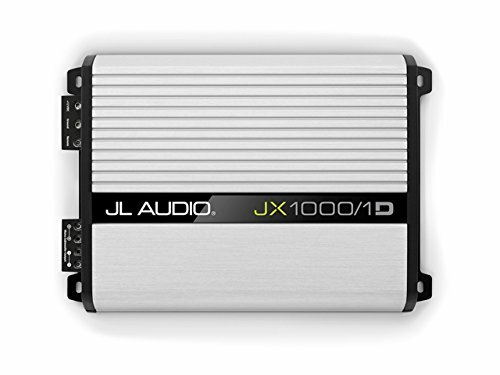 Overall, the JX1000/1D is an excellent amplifier for almost everyone. It is fairly affordable, lightweight and compact. It is capable of delivering 1000W RMS, which will definitely makes your speakers thump. Be sure to check out this amplifier today! Some audiophiles will want to push things to the limit and use a wide variety of different speakers. If this is something that sparks your interest, you’ll definitely want to choose an amplifier, which works on several different channels. The JL Audio XD600/6 is capable of working as a 3, 4, 5 or 6 channel amplifier. The amp is equipped with RCA jack inputs to provide your system with extreme noise immunity. It also utilizes an on-board crossover for more functionality. The overall dimensions of the amp are 10.23 by 7.09 by 2.05 inches, which makes it very compact. The amp can be configured to operate in a low-pass or high-pass manner. Although the amp is a little more expensive, the majority of consumers will agree that the price hike is justified. The overall weight is right around 7 pounds, so it isn’t overly healthy. With this amplifier, it is possible to deliver 200 watts of power to two individual subwoofers. The black powder-coat finish is very cool and will look awesome no matter where you put it. At the end of the day, the majority of audiophiles will have a field day with the XD600/6 amp. It might be a little more costly, but it delivers quality, power and versatility that are unmatched. In fact, this amp might be a little too much for the average consumer. However, if you want to take things to the extreme, you should definitely check out this amplifier. If you rely on music to keep you entertained while you are riding your motorcycle long distances, you will definitely need a sound system and amplifier that will offer you a powerful, clear sound. The Rockford Fosgate PBT300X2 is compatible with all street bikes. Below you will discover more information about this particular amplifier. The Rockford Butterworth crossover will work with existing 12dB/octave speaker systems. This compact motorcycle designed amplifier can be hidden pretty much anywhere on a motorbike, especially inside of the seated compartment. 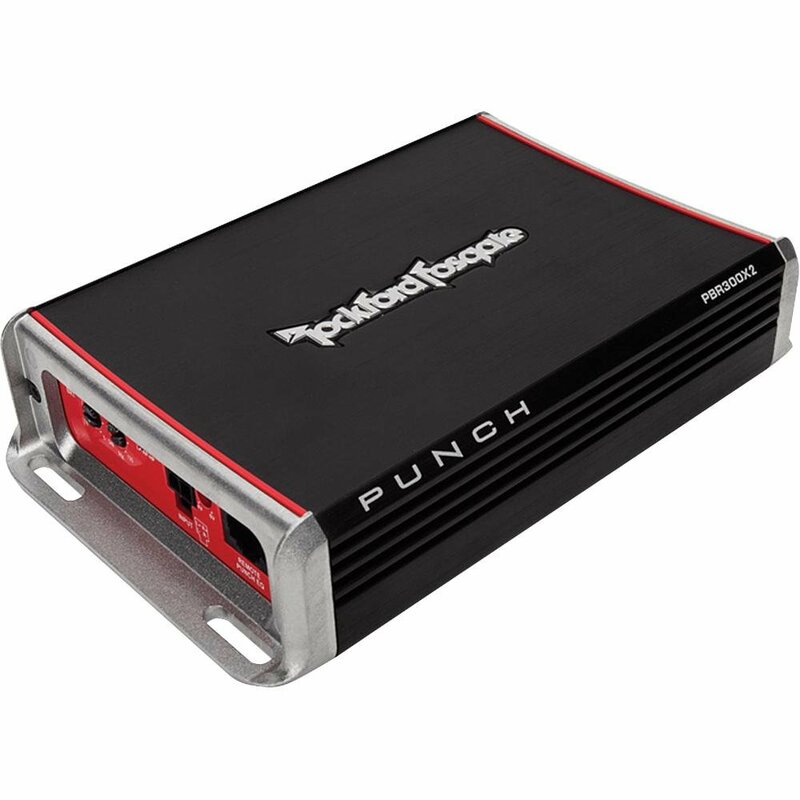 The Fosgate Punch is capable of emitting loud, clear sounds even when you are going 75 miles an hour, without interference. You can install this amplifier on your motorcycle within 30-45 minutes, but make sure that you read the installation instructions carefully, before you begin the task. If you are looking for a high-quality amplifier, you should look no further than the Rockford Fosgate PBR300X2. It will provide you with an abundance of power and longevity, so be sure to keep this brand on your list of prospects, when searching for a motorcycle amp. There are many excellent amplifiers on the market, but a lot of them are simply too pricey. This isn’t the case with the Hifonics ﻿ZRX1216.2 Zeus. This amplifier is incredibly affordable. Of course, this doesn’t mean that it is any lower in quality, because it is not! This car amp is capable of providing you with 1,2000 watts of power! Of course, it can be used as a two-channel amp, which will provide both speakers with 600 watts. This is great and gives you the ability to customize your audio system’s setup, when using this amp. Take note that you’ll need a 12v battery, in order to use this amp. The amp is fairly compact and only weighs 12 pounds, so you shouldn’t have any problem getting it installed in your vehicle. The chrome design of this amp is very cool and presents you with a modern appearance, which will look great alongside your speakers and woofers. Below, you will discover the pros and cons of this amplifier. 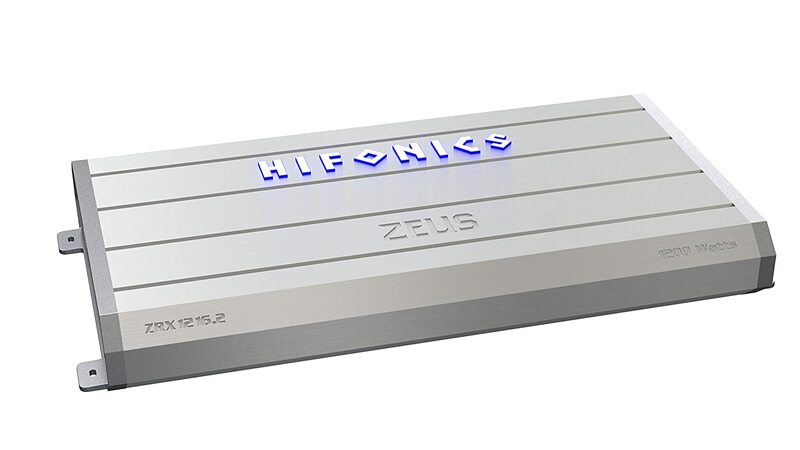 At the end of the day, most audiophiles will absolutely love the hifonics ZRX1216.2 Zeus. It delivers astounding power, at a low price. At the same time, it is compact, lightweight and very easy to install. It is versatile and can be used with two speakers. For the price, this amplifier is well worth exploring further! If you’re looking for the best amplifier that you can possibly find and don’t mind splurging, you might be able to find a winner in the JL Audio XD500/3 Car Amplifier. This amplifier is very aesthetically pleasing and delivers a very impressive design. With this amplifier, you can customize your system even further, thanks to the 3-channel compatibility. The amplifier is very small, when compared to the amount of power that it can deliver! This device offers 75w x 2, as well as 300w x 1. It is capable of delivering 300 watts of power to your subwoofer to help ensure that your audio system delivers a big thump. It is also equipped with a 12 dB octave high-pass filter for the main channels. It also has a low-pass filter, which works with its subwoofer channel. The amp delivers a frequency response of 12 Hz to 22 kHz for the main channels and 10 Hz to 1kHz for its subwoofer channel. It only weighs 4.8 pounds, so you won’t have a problem putting it into your vehicle. When it comes down to it, the JL Audio XD500/3 is an excellent amplifier. It offers tons of flexibility, plenty of power and will definitely deliver a thud. The amp might be small, but it is incredibly powerful. In fact, it could fit underneath your car’s seat, if you desire. For this purpose, this amplifier is well worth checking out in further detail. 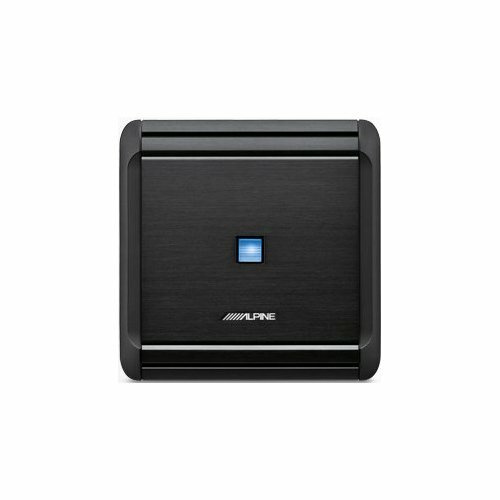 If you are looking for a small amplifier to soup up your current speaker system, you should look no further than the Alpine MRV-F300. This device is compact in size and will fit in tight spaces. Keep in mind that this is a low-heat amplifier that is only going to be utilized for mid-range quality. Below you will discover more about this device, so you can make the right decision of whether or not it is suitable for your needs. The Alpine amplifier is designed with a cooling system, which will prevent it from overheating, even when utilized for long periods of time. Do not overestimate this small amplifier, because it will get very loud without distorting the sound. The Alpine MRV-F300 is a great alternative for someone looking to upgrade their existing stereo system. It will emit a clean, powerful punch every single time. If you’re interested in completely customizing your audio system, you’ll need to choose an amplifier, which offers various channels. This amp is one of the most versatile on the market. It can be used as a monoblock, 2-channel, 3-channel, 4-channel or 5-channel amplifier. This will give you the ability to use this amp with almost any type of speaker setup that you can conjure up. The amplifier is extremely reliable and comes with a 1-year manufacturer’s warranty to provide you with even more peace of mind. This amplifier is capable of delivering 500 watts to your woofer. It also offers a soft start turn-on, so you won’t have to worry about the system popping or crackling, when you switch it on. The amplifier is a little heavier at 8.2 pounds, but this still shouldn’t cause a problem. The amp is small enough that is could be mounted under your seat. More pros can be found below. Overall, the Polk Audio PA D5000.5 900W Amplifier is an excellent option for the majority of consumers. It offers plenty of options, tons of powerful and can be mounted under your seat. It does get a little hot, so you might want to consider purchasing an external fan to keep it cool. Otherwise, this amplifier is well worth exploring in more depth.